As mentioned in several previous posts of mine, including the one about Shetland haps, I wanted to try the Feather and Fan stitch pattern for quite some time now. 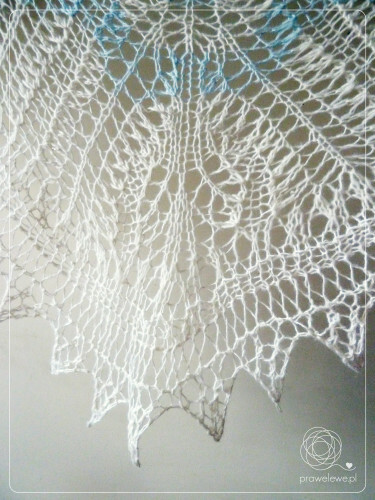 Obviously the other traditional border pattern for haps- Old Shale- is the most popular, and I must admit, much easier to knit, while Feather and Fan lace is quite challenging when it comes to the tension. Since haps are generally heavily blocked, one needs to introduce some tricks to their knitting in order to get the Feather and Fan pattern keep its form. I made several tests with this hap, trying different needle sizes, and finally decided to go with 3 mm/ US 2.5/ UK 11 and 8 mm/ US 11/ UK pair. It might seem a huge skip but it really needs to be like that. Once you finish knitting this piece, you will know what I mean. Although the border pattern is not that easy to walk through (knitting four stitches together might be a challenge for many), I will definitely be back to it since it gives different results depending on the needles size used. Very intriguing! The Arctic Air, as its name suggests, is to be the loftiest of all the three Arctic Aura haps, and since my central square base is to be made with the same needle size in all the three wraps, it is the border needles’ size that needs to be adjusted, especially that the Feather and Fan stitch pattern takes away a lot of elasticity of the central square’s edge. The pattern is available from the pattern section → Arctic Air. Other haps in the Arctic Aura family are: Arctic Water and to Arctic Land. Enjoy working with the instructions and please do share photos of your WIPs and FOs in my prawelewe group on Ravelry. It would be lovely to hear from you once you finish.